Permanent hair reduction with the Energist Ultra VPL™ is easy and effective. The treatment works by using the variable pulsed light (VPL) energy to target the melanin in the hair. 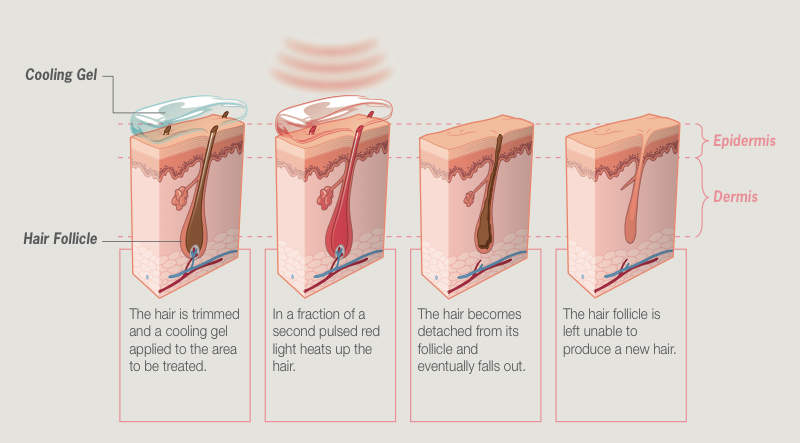 This is aimed at selectively heating the hair follicle to a temperature that inhibits the follicle from regenerating. The variable pulsed technology delivers the light energy in a short multi-pulse that allows the skin to cool slightly while the hair retains the heat. This increases treatment comfort and overall safety. Hair grows in waves and only hair follicles that are in the Anagen or growth phase can be treated. Therefore, a series of treatments spaced 4-6 weeks apart is needed to complete the permanent hair reduction. The Energist VPL™ treatments for permanent hair reduction are suitable for a wide range of hair and skin types. In your initial consultation at a Like Your Look clinic your clinician will assess factors such your skin type, hair colour and density of hair and will tell you how many treatments you may need to complete your permanent hair reduction. Accuracy of light emmission – Energist VPL produces consistent pulsed-light output so the settings your clinician chooses will match the output at the IPL handpiece. Energist VPL handpieces must be replaced after a set number of shots meaning the pulsed light output will remain within safe parameters. Lower quality devices that have a set number of shots will decline over time and become either ineffective or unsafe. Ability to adjust the timing and number of light pulses – The Energist VPL can deliver a variable multipulse of very short light pulses separated by a fraction of a second. The skin cools faster than the hair follicle so the hair reaches the temperature necessary for effective treatment while the skin stays at a safer and more comfortable level. Even light emmission across the treatment area – Lesser quality IPL equipment can have a hotspot in the middle of the treatment area and lower energy towards the edges. The operator must overlap the pulses of light which increases the risk of uneven treatments or injury if overlapped too far. Energist VPL has an even energy distribution across the entire treatment area which reduces the risks of over treatment. By choosing a clinic that uses quality equipment you will be able to achieve high-quality results and have greater confidence in the treatment process.